The Beaded Journal Project has begun again. The third round of this amazing project begins with January 2010 and will end in December. 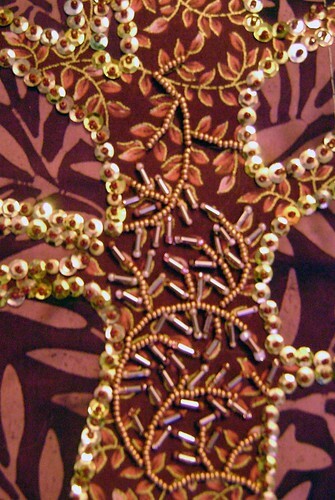 The goal is to make a beaded work of art that is a visual journal representing that month. You can read more about the project at the website. This year there are hundreds of people participating. I am part of blog #3 along with 100 others. So this is my January page in progress. Last year, I did alter style pages that were big (8″x 10″) and an odd size, which is making it difficult to finish them off in a professional looking manner. But it will be done, eventually! Meanwhile I move on. This year I thought about a doll shape either flat or 3-D. But I decided that would be pushing it again. Last year was really my first exposure to beading and it was a wonderful challenge. I decided on a small (4″x6″) size and a basic postcard shape. I learned quite a few things from Robin in her class, so these are not multiple layers with batting (like last year’s, which added to the complication of finishing.) Instead just a simple piece of paper backs the fabric. I chose “Journey” for my guiding word for 2010, so these pages will hopefully be in tune with that word as well. But I have also been very interested in the tree as a symbol lately. I like the idea of growth, the protection of bark, the stability of roots, and even the element of annual life, death, hibernation and rebirth. This month’s page represents that symbol. I still have quite a bit that I want to do on this page, but it is moving along smoothly. 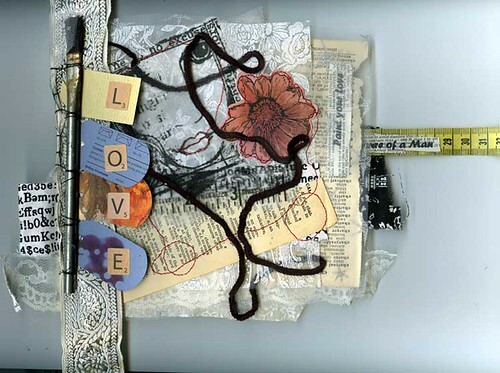 This entry was posted in Bead Journal Project, Fiber Goodness, Passions and tagged art, beads, BJP, challenge, collage, experiments, WIP on January 24, 2010 by Sheba. As the Beaded Journal Project comes to a close I have been thinking a LOT about how to share and present the work. Although MY pieces are far from done and I am a couple months behind, I am still thinking about the closure of the project. I tend to have a problem with closure though, and will jump to the next project before finishing the previous one. I am trying not to do that for this project. I want to honor it on a different level and make it be the finished work that it deserves to be. I am also contemplating my artwork on the whole. What am I doing? Where am I going? I know that I am moving away from paper, away from mixed-media sculpture types things. I am slowly culling my supplies and rearranging my studio to reflect this change. BUT I am torn. Mostly because of my day job, that of a middle school art teacher. I really am required to continue to work and learn about a variety of mediums, try out new supplies, create new projects that can guide or inspire my students. I am also a Gemini, which does lead to a scattered interest in a ton of different mediums. While I dabble in all these places, I am not reaching a skill level in my own medium that satisfies me and allows me to create a solid body of work. This is frustrating and disappointing. I haven’t had a series that felt like a body of work since my last show in 2003. That’s SIX years! And that was my paper/window collage work. So with all my learning and experimenting in fabric over the past six years I haven’t reached a place of mastery nor a definitive direction. I think my work is taking the direction of small fabric journal pages or mini quilts, but sometimes I want to work larger! I have in mind a few ideas for a series or two, but then I can’t decide if they should be individual pieces or put together as books. 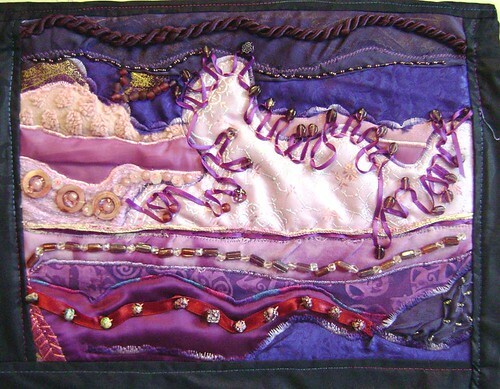 Then there are these ideas about working with quilts that are framed by larger objects. I have ideas about sets of art dolls. I want to print, dye and stamp my own fabrics. 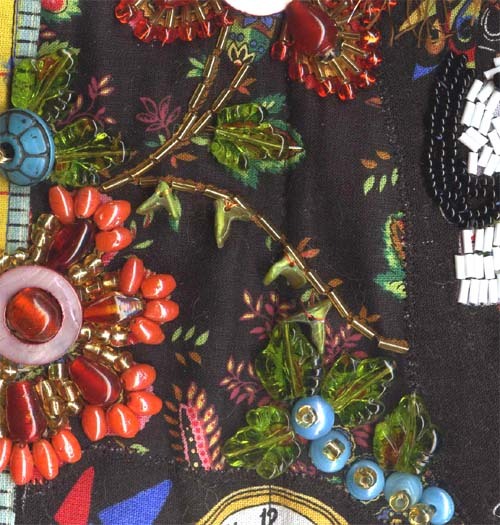 Do I want to learn some more complex and traditional quilting skills, or keep doing my hodge podge applique/quilting style? 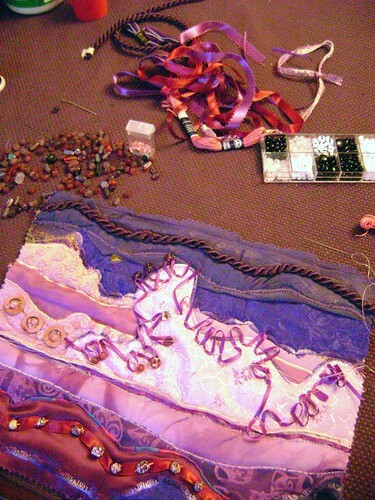 on a somewhat related note: While I researched textile arts to find my direction and look for some ways to finish my beaded pages, I ran across this great article that talks about fabric art journals in general, and directly links to a blog and the project I participated in a few years ago. (Which reminds me that I need to make a cover for my wonderful pages that I received.) This brings up the question about sharing this type of work. Do I want to pursue my work getting published or find the right kind of shows to enter? Well it seems like all I have come up with today is questions, not answers. But I guess that is the way life is sometimes. Perhaps I will go express myself in some beads and see what develops. 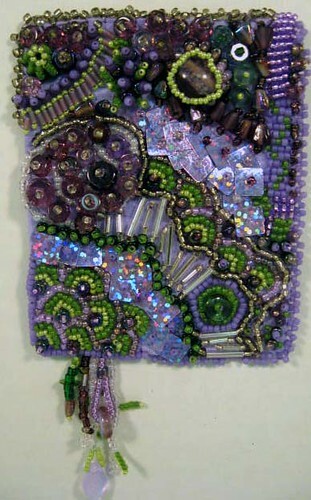 This entry was posted in Bead Journal Project, Passions and tagged beads, BJP, Fiber Goodness on August 18, 2009 by Sheba. November 2003 is when I became a dog lover, when I was completely won over by my first BIG dog. So this month’s page will honor Charger and his big stupid grin. This is the fabric quilt prior to beading. I have some scrabble letters to spell out the word “love” and then plan to bead some borders, bones and his hat and scarf. Not sure what other beading I will do, this one will probably be pretty simple. See my other month’s pages here (plus theflickr album) and more about Charger here (plus HIS flickr album) . I had contemplated doing something election oriented but decided that at this point, Charger is more of an influence… perhaps January will be about our new President. 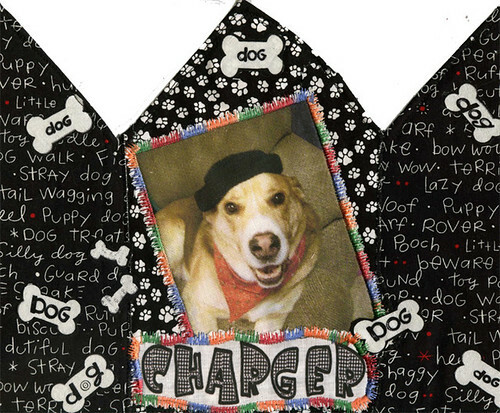 This entry was posted in Bead Journal Project and tagged art, Beaded Journal Project, beads, BJP, Challenges, Charger, dog, mini quilt, November, quilt on November 9, 2008 by Sheba. So this is the first of my 12 alter/door style journal pages. I am still up in the air as to how I am going to finish/back them. If I will do the sculptural approach in which case I will need to do more work on this one. This piece is 11″W x 8″H at the peaks. 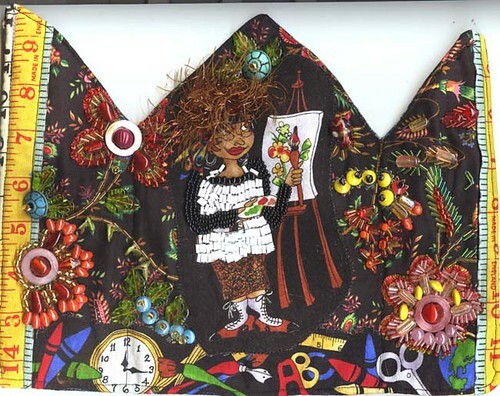 It is made from a ‘novelty’ fabric (one with the teachers, combined with a separate one of the flowers and edged with a third of the measuringtape. I included the tape because I have been working hard and lost 13 pounds over the summer. Plus it looks like a school type thing. Now to go figure out October’s page…. This entry was posted in Bead Journal Project, Challenges, Fiber Goodness and tagged art, beads, BJP, Fiber Goodness, quilts, sewing on September 30, 2008 by Sheba.